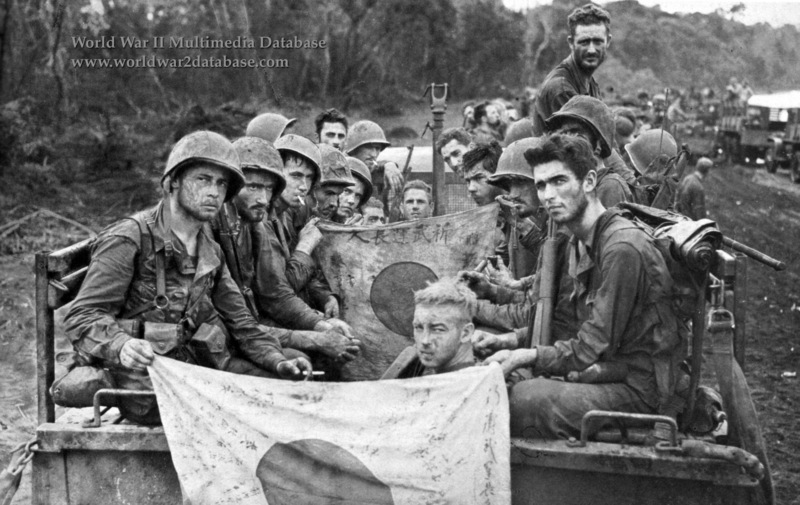 Soldiers of the 1st Marine Division display Japanese flags captured during the Battle of Cape Gloucester. New Britain was defended by the Imperial Japanese Army's 17th Division, under Major General Iwao Matsuda; reinforced by 65th Independent Mixed Brigade and elements of the 51st Division, known as the Matsuda Force. The strain and fatigue of 23 days on the line at Cape Gloucester is clearly shown in the faces of these men of the 7th Marines, relieved after taking Hill 660. They trapped the Japanese between 60mm mortar fire in front and 81mm and artillery fire in back, then overlapped the impact areas; over 100 Japanese were caught in the open and killed. Later the 5th Marines attacked and neutralized Matsuda's Command Post. New Britain cost the reinforced 1st Marine Division 310 killed in action and 1,083 wounded. The remains of the Matsuda Force were ordered back to Rabaul to defend the base. For the rest of the war, 40,000 Japanese starved and were harassed by a much smaller Allied force. 1st Marine Division was relieved by the US Army's 40th Infantry Division and prepared for the Peleliu operation.